Volvo has announced that all of its new models that will come off the production line in the next few years will have Google Maps, Assistant, and Google Play Store as part of its Sensus infotainment system. Volvo had previously announced that it is collaborating with Google on the development of an Android-powered infotainment system, but even if you don’t have an Android smartphone, you will soon be able to enjoy the main features of Android Auto in new Volvos. Audi is another company that has announced that it would be soon switching to a branded infotainment system built on Android Nougat 7.0. Volvo would still have a lot of leeway in terms of styling the overall infotainment experience. 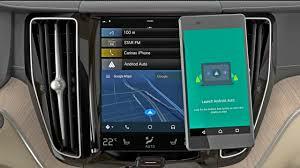 Google had recently announced that it would be revamping Android Auto to make it smarter and more attractive visually. Android Auto will soon have the capability to support group messaging, and offer Rich Communication Service, or RCS, which is billed as Google’s take on what it says would be the ultimate messaging app. When it comes to media apps like Spotify, they can now make search results available to the top level of Android Auto. From the development perspective, Google is making new templates available to developers ad these templates would make it easier for them to surface more immediately actionable information when apps are opened in Android Auto. This would reduce the number of taps needed to get what you need on Android Auto and minimize distracted driving.